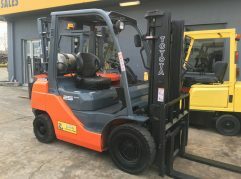 Excellent condition Nissan 4.5 tonne forklift. With a Vortec V6, this 4.5 tonne capacity forklift has great pulling power for the heaviest loads. Commanding driving position with a 4.5 metre lift 2 stage clearview mast means you can see where you are going and what you are taking there. The fork positioner attachment with huge 1800mm tynes allows a wide variety of loads to be carried, and solid tyres ensure stability and strength. A great forklift for any application, this 2001 model Nissan 4.5 tonne used forklift comes with a 12 month drivetrain warranty, full service, new paint and low running hours. grab it before someone else does!